This beautiful stag "classic" sired by Am. Ch Fiero's Tally-Ho and Am. 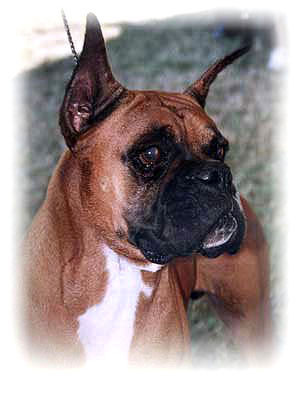 Ch Bentbrook's High Potential ( 3rd generation Bentbrook) comes from a long line of outstanding Boxers. Quote by Barb Carroll: "It was challenging showing a plain Boxer during those years but, in spite of this, Chip became recognized as a truly magnificent Boxer by many prominent breeders, judges and handlers." 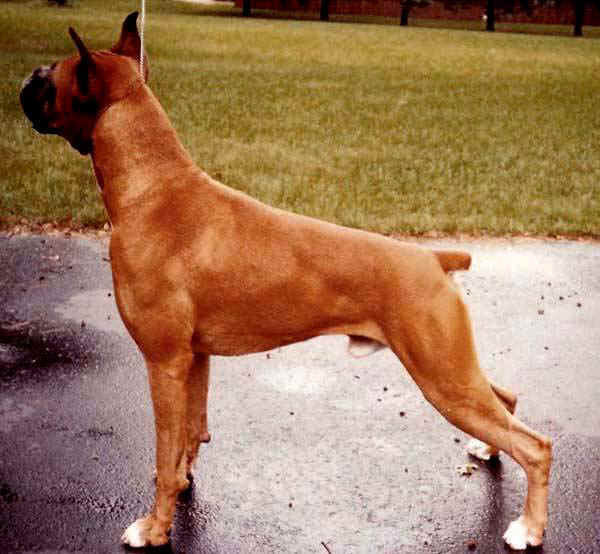 It was Barb's intent , as one of the earlier pioneers of showing a "Classic" in Conformation, to have this fine Boxer judged on the beauty of his absolutely outstanding conformation and movement and NOT on his plain coat. Since these years , changes have finally occurred within the judging community, with the help of John Connolly, Stephanie Abraham, Joe Heine to name a few. Following is a quote by Stephanie Abraham about Blue Chip at the time of his passing in 2001: "Even though he was lacking just a few points to become a Champion , Chip will ALWAYS be remembered as a true Champion." lacking 3 pt. Major for Championship!